Can you believe it? The year 2014 has come to an end. The holiday season is a wonderful time for us to remember the moments that brought us where we are right now. A lot happened to DNAdigest during this past year. In 2014 we ran some wonderful Hack Days in April and August, a Wikipedia Ediathon in May and a Symposium in November, which was a great success. Meanwhile, from DNAdigest we spun out our software development activities into the social enterprise Nucleobase to build an online platform (Repositive.io) to facilitate genomic data sharing and in May 2014 Nucleobase won a place on the 2014 cohort of the Big Venture Challenge to seek funding for this idea. Since then, Nucleobase has rebranded as Repositive and the Repositive team will continue to contribute to DNAdigest through pro-bono work and assistance in organising the DNAdigest communications, research and public events. In the summer, the DNAdigest team moved to a new office and is now placed at the Future Business Centre, Cambridge and our team grew a lot with the welcoming of our new members: Adrian joined as a CTO of Repositive, Seb, Francis and Tim became our new web developers, Margi joined as a communications assistant and Nadia as a bioinformatics scientist. We also had the pleasure of working with Hamza, who successfully did his 6-week summer research internship sponsored by the Nuffield Foundation. In September we published a paper called “The need to redefine genomic data sharing: A focus on data accessibility“, where we showed how the habits of genetics researchers regarding accessing shared data sets is highly influenced by the ease and simplicity of access. At the same time, researchers find sharing of their own data very complicated, further highlighting the fact that we need to promote and support all projects that facilitates and simplifies efficient and ethical data sharing. With all these achievements to give us motivation, we are really looking forward to the beginning of the new year. 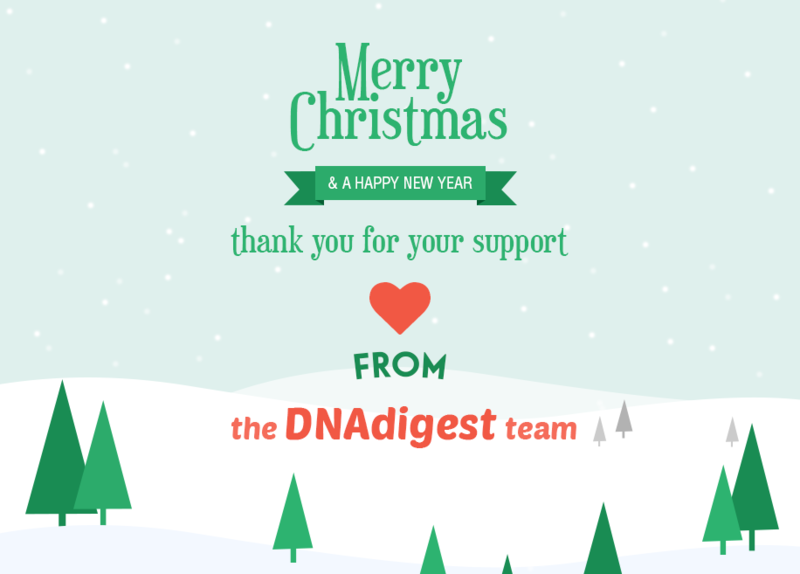 DNAdigest team would like to take this moment to say thank you, all our followers and readers, for the support. May your holiday season and the new year be filled with much joy, happiness and success.